Tillman Talk: A Painting of Cantillon? This past weekend I attended the Mises Institute for the Austrian Economics Research Conference (formerly ASC). First I should say that the Mises Institute has put together another great conference. I believe that I have missed only one ASC since the beginning (and that was because I was at another Austrian Economics Conference in Prague). Of all the papers presented there, the most interesting (at least to me) was the one presented by Mark Thornton. He has been attempting to solve an almost three centuries old mystery surrounding the most mysterious economist of all--Richard Cantillon. Cantillon made his fortunate in John Law's bank during the South Seas Bubble and managed to get out just before the collapse, leaving him one of the wealthiest men in the world. Now to add a twist, there is a mystery surrounding his death. Was he murdered and the house burnt to cover up the crime? Or did Cantillon fake his own death to live out the rest of his life in Bora-Bora or somewhere in South America? We may never know. Another mystery is what did Richard Cantillon look like? How can there not be a painting of such a wealthy man? It is at this point that Thornton's paper "A Man and his Family" jumps into the picture. Thornton's paper is posted here, and the audio of the session is here as an mp3 audio. Or you can follow this link. Many scholars have been looking for such a painting with no luck. It is at this point that Thornton picks up the detective story. Thornton has been looking for a picture of Cantillon for the past 10-15 years. The last time he was at the Louvre may prove to be the big break he (and all of us) have been hoping for. He might have made the big discovery. Thornton argues that the painter, Largillière, knew and painted Cantillon, his wife and daughter. I freely admit that I am biased and have a low threshold of proof on this matter, nevertheless, I am cautiously optimistic. 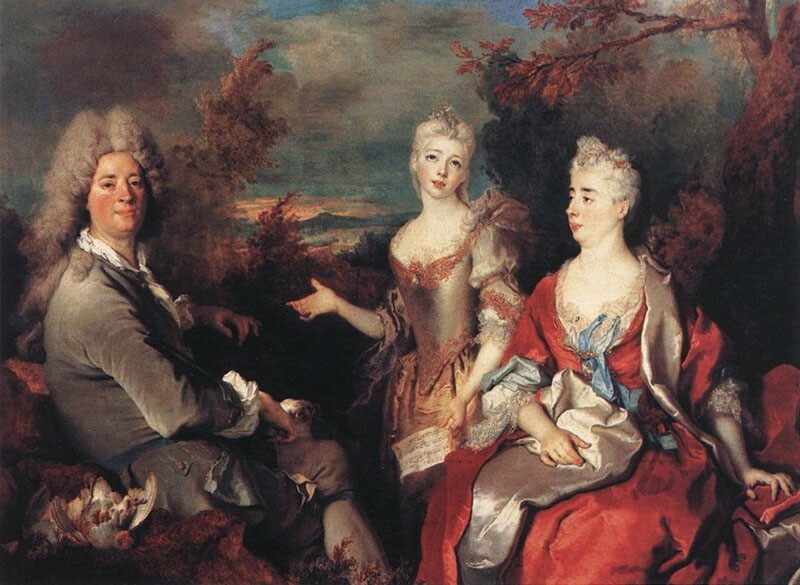 Here is the painting that Thornton claims is Cantillon and his family. It is clearly the same man. He is younger and while wearing very expensive clothes, his shirt is undone. It is a sign that he is a part of the "nouveau riche." That could very well fit Cantillon and his rise in status during the up swing of the bubble. Great stuff! Not sure what Mark will do for an encore, other than sponsor a Cantillon conference in France! "a painting which positively identifies Mary Anne Cantillon"
Is such a painting known to exist? Or is this something that awaits future discovery? Yes, the painting exists. Mark had it in his presentation. 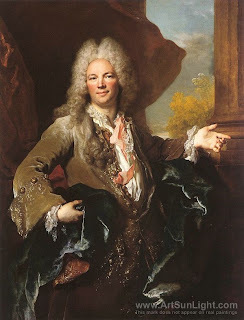 Henriette Cantillon was born in 1728. She cannot be the one on the painting, since she was 2 years old in 1730. I am surprised Thornton did not realise that ! Loved talking to Dr Mark Thornton about Richard Cantillon on the Economic Rockstar podcast (episodes 18 and 19).